Peter Sagan is such a colossal figure in cycling that it’s odd to thing he doesn’t necessarily have more of a claim to greatness than Michal Kwiatkowski. Sagan does wheelies and snarfs Gold Bears like some sort of Haribo-vacuum. Michal Kwiatkowski is a Polish guy with sticky-out ears. But performance-wise, what’s in it? Sagan is of course world champion, but Kwiatkowski’s been there, done that. Sagan’s won the Tour of Flanders; Kwiatkowski’s won Milan-Sanremo. Drop down a step and Sagan’s won Gent-Wevelgem a couple of times and E3 Harelbeke; Kwiatkowski’s got a pair of Strade Bianches and an Amstel Gold. You don’t have to know what all these races are. My point is that if Sagan wins a bit more often, there isn’t really anything between them when it comes to the big stuff – yet Sagan’s the focus of the sport and the Pole’s just some guy who beats him half the time. 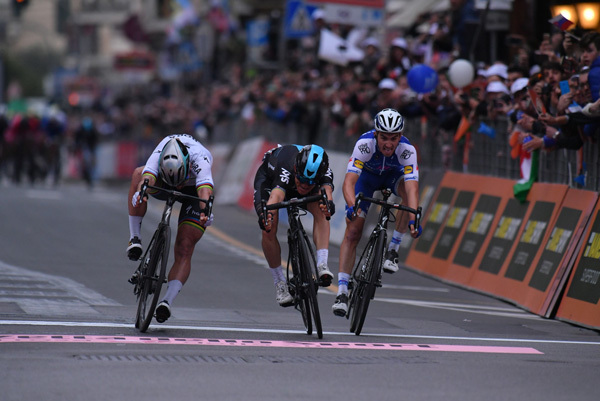 Towards the end of this year’s Milan-Sanremo, Sagan launched a visceral attack on the Poggio and only Kwiatkowski and Julian Alaphilippe could follow. The commentators spent a little while discussing whether there’d been a rider quite like Sagan since Eddy Merckx at this point. And then Kwiatkowski won. It’s hardly unheard of. You’d think he’d have come to terms with it by now. I’d definitely agree that Sagan’s achievements are sometimes overstated – by Peter’s age Boonen had already won 4 monuments. If you were looking at the most impressive palmares in the current peloton you’d need to perform some serious contortions to put him ahead of Tom, some of the multiple GT winners like Contador/Nibs/Froome or guys like Valverde/Gilbert and maybe even Cav (though that’s more debateable). He really should have had a brilliant career by the time he retires and he may well surpass those guys eventually but he hasn’t yet. If commentators were honest they’d say that Sagan is a fantastic rider and an all-time great at animating races and making their jobs easier. I do think you’re missing a little out if you say that the excellent Kwiatko matches Sagan though. Peter has 2 World Championships to his 1 as well as 5 Green Jerseys and 11 Grand Tour stage wins whereas the Pole has no jerseys or stage wins at all. Mischievous omissions on my part, but only to talk up Kwiatkowski, who I think lives in his shadow a bit. You can probably expect an article about how Sagan competes in almost everything, all year long at some point, and how this is one of the things that elevates him above other riders. I definitely agree that Kwiatkowski is undervalued. He’s 26 and he’s already won a monument and a world championships. I think some of that comes from the fact that he’s in Sagan’s shadow (like everyone outside the biggest GC guys) and I think some of it is because of the way that Quickstep handled him. They seemed to want him to be a GC rider, so even while he was doing well in one day and week-long races, he was sometimes seen as a so-so grand tour leader. After his World Champ win my abiding memory of his 2014 season isn’t the 2 podiums in the Ardennes but him getting passed by everyone when Tony Martin set him up on La Planche des Belles Filles. If he achieves his stated aim of winning LBL this year then hopefully that will all change.